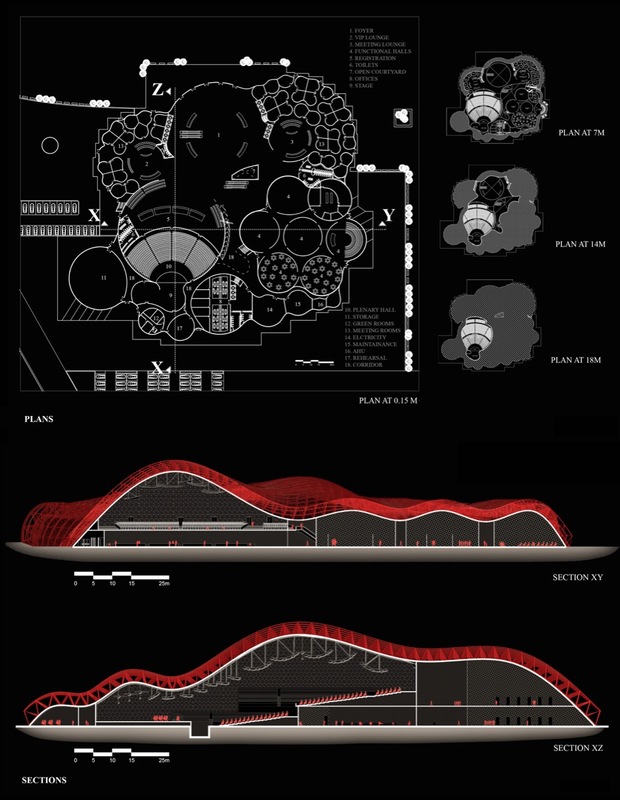 Revamping Pragati Maidan, New Delhi, by Deepankar Dass Sharma - ArchitectureLive! In 2016, as per the proposed plan by the higher authorities in India, Hall of Nations & Hall of Industries at Pragati Maidan in the heart of the capital city (New Delhi) of India are to be demolished and the whole site is to be revamped. But this entails not a mere demolition of few old buildings, it is the demolition and destruction of India’s heritage, traditions and indentation globally. These buildings celebrated 25 years of India’s independence in 1972 by being the first man made concrete space frames constructed at such a scale along with being symbolic of a traditional jaali. These structures are largely celebrated all around the globe. 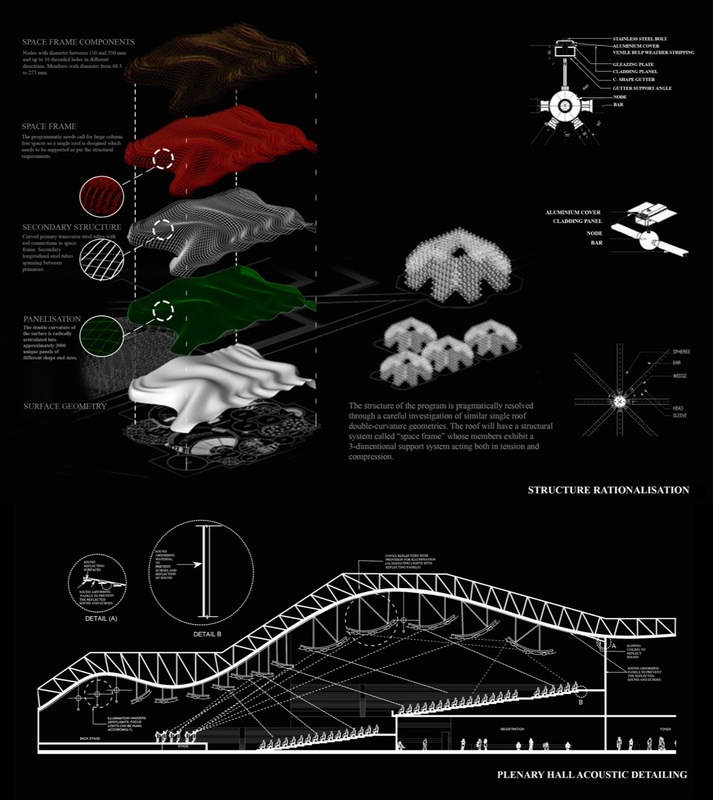 This thesis is an advanced analytical and diagnostic research to collaborate with, contribute to and contemporarise the existing Iconic Structures ( Hall of Nations & Hall of Industries) at Pragati Maidan, New Delhi, India (without demolishing it) with an associative and algorithmic designing technique that is technologically viable in the current scenario. 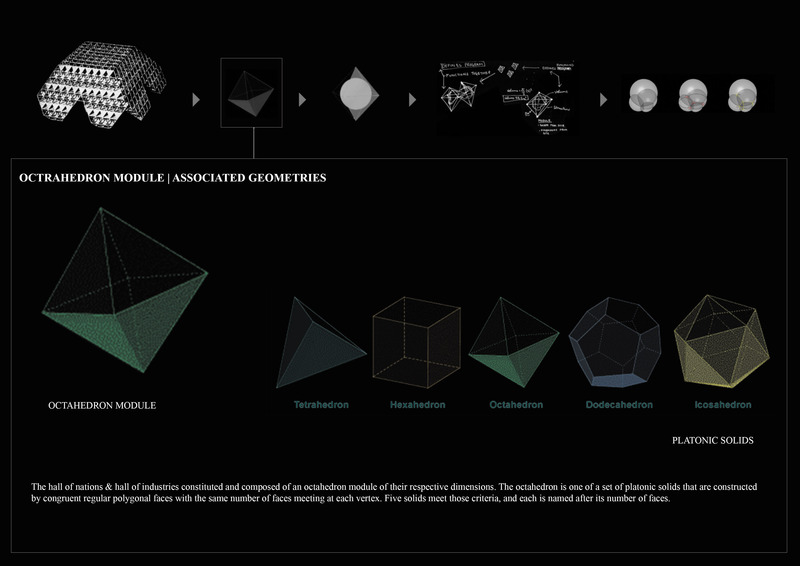 In Parallel, the research also investigates the limitations of the current market in terms of the fabrication of a material in different geometrical configuration (non-planar/curved/doubly-curved) and the feasibility of fabricating materials in different geometrical configurations on a large scale. 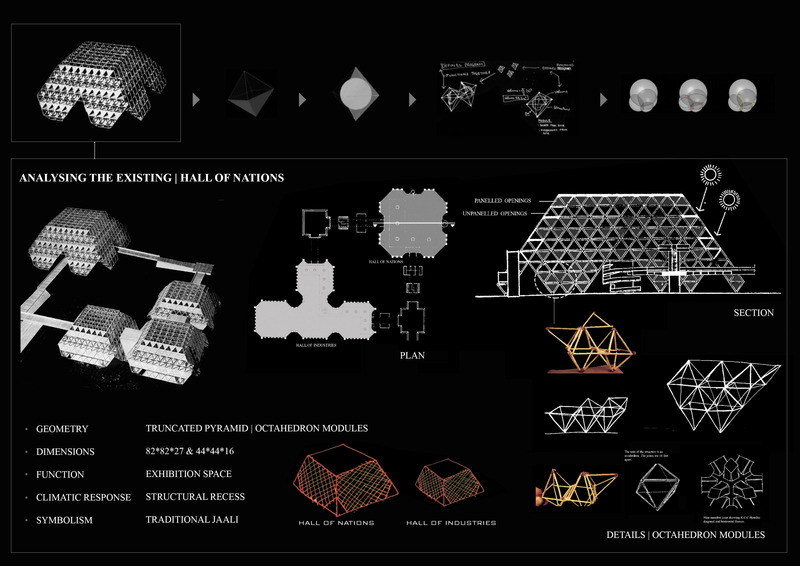 To contemporize the existing iconic structures-Hall of Nations & Industries by critically investigating the various parameters and layers (Geometry, Dimensions, Function, Climatic Response and Symbolism) associated with these structures. 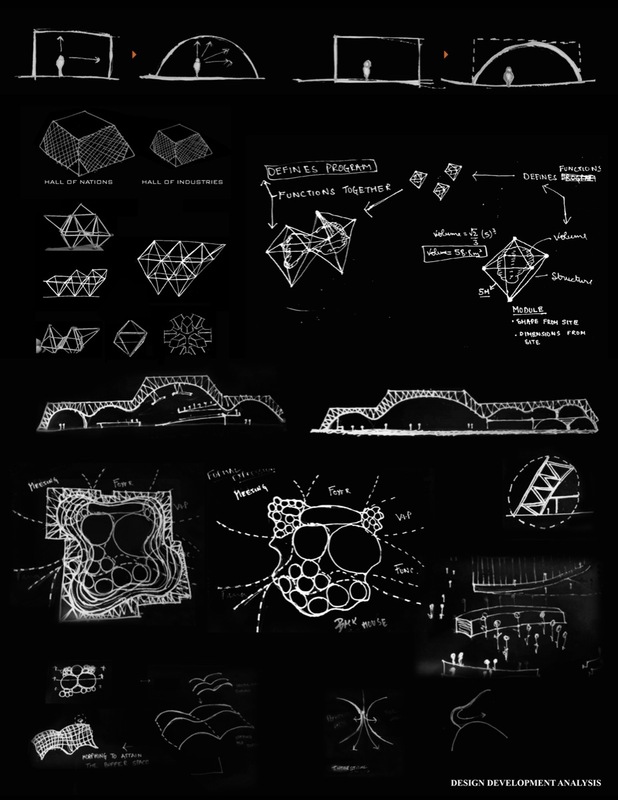 To probe the potentiality of a flexible design (not altered by present material limitations & current fabrication industry) with the available technology (computational design) which enables, aids and makes it viable for architects to explore complexities of design and realize it in the Indian context. The principal intent of the design is to produce a product that negotiates itself with the existing, acknowledges the monumental presence, learns from it, interprets it and eventually realises itself as a contemporary translation of the same. 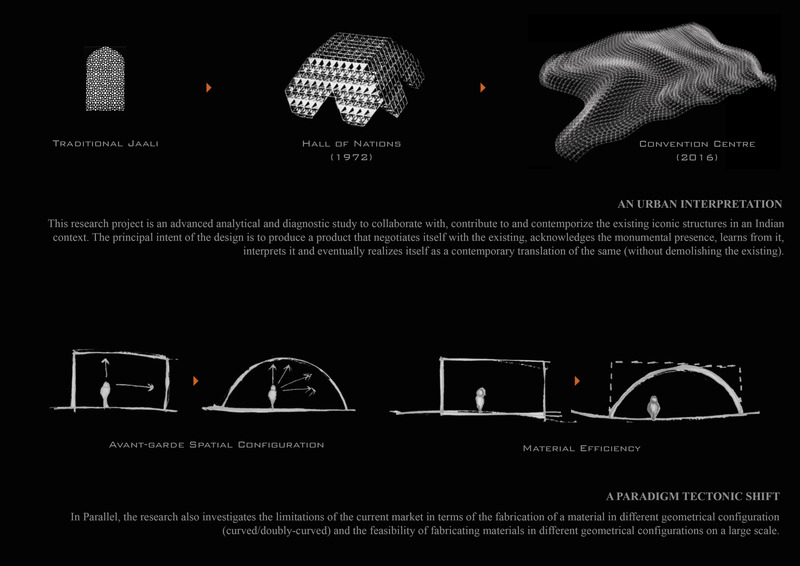 The research further establishes the fact that the double-curved surfaces being the subordinates in the fabrication industry (if form a minimal surface for any given habitable function or program) have the ability to optimize the overall cost of construction through the efficient use of material for the whole project. 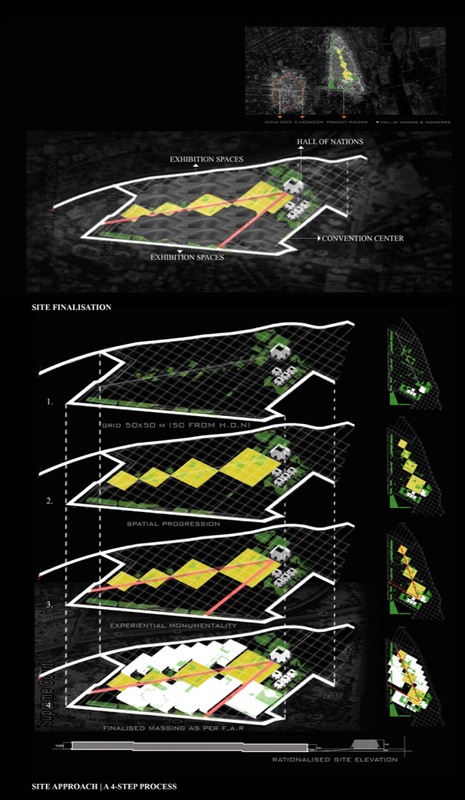 It is imperative to investigate the possibilities and permutations of ideas and designs that can be rationalized as a habitable program while learning from the existing and interpreting it in the current scenario (in the year 2016) with the urban necessities and technological opportunities available to us. 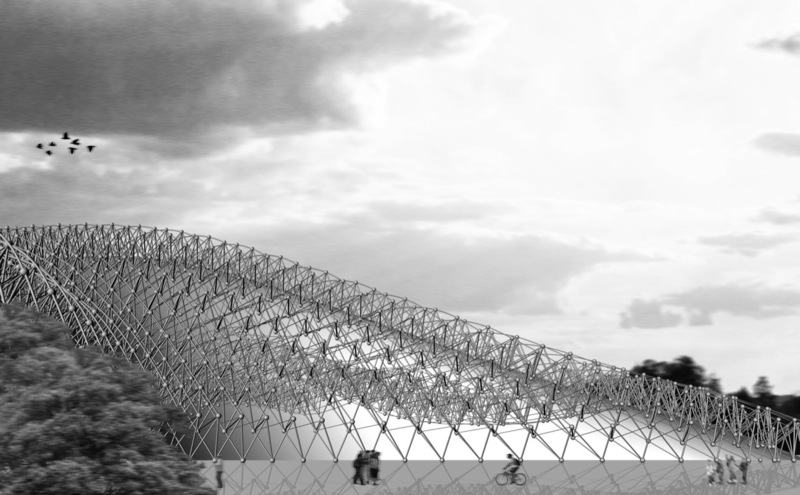 The investigation culminates with a result that drastic changes are required in the current fabrication industry for more efficient and sustainable designs. This entails the departure of (more than a century long) mass production of materials to customized production of the materials. The use of the current technology (computational design) available is also imperative to achieve efficient results. 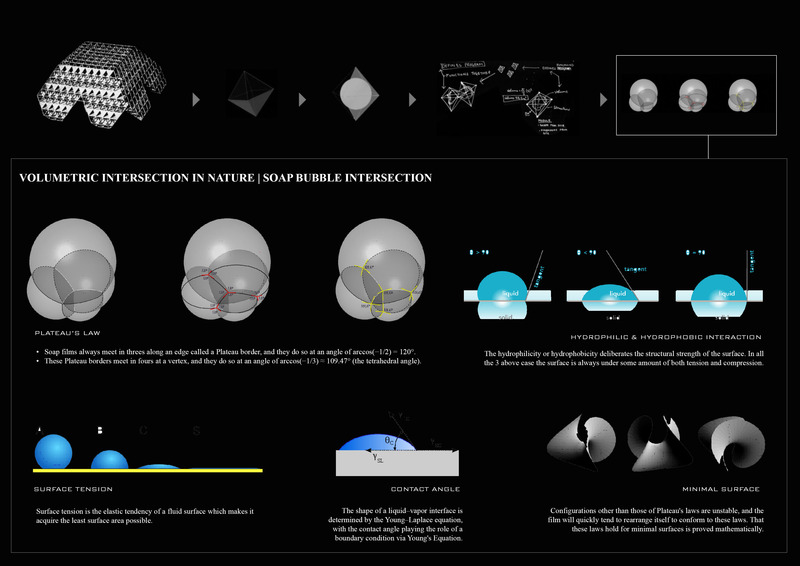 This study examines and investigates various properties and phenomena associated with soap bubble intersection in nature. 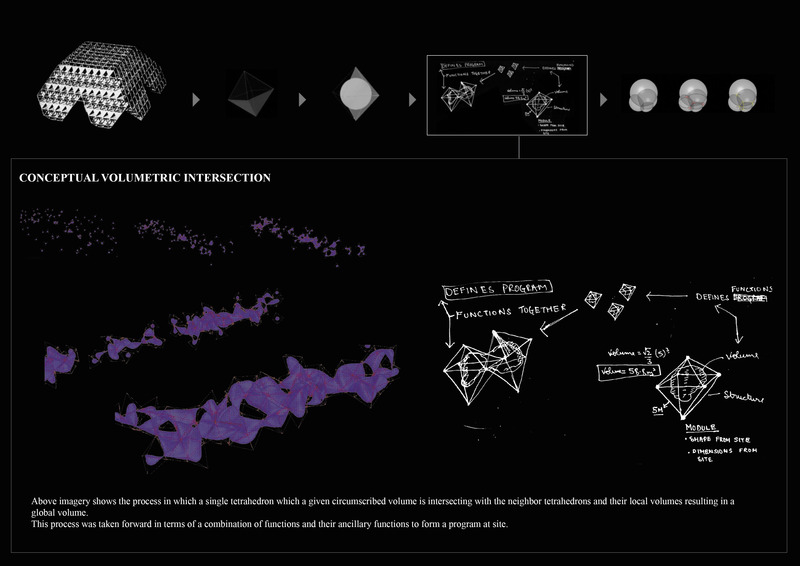 The investigated properties act as driving rule for the form generative process. The rules along with the functional requirements for the program formed an algorithm which led to the global form of the structure through the local modules employed and intersected as per the functional needs. The design resulted in a variety of sequential iterations. 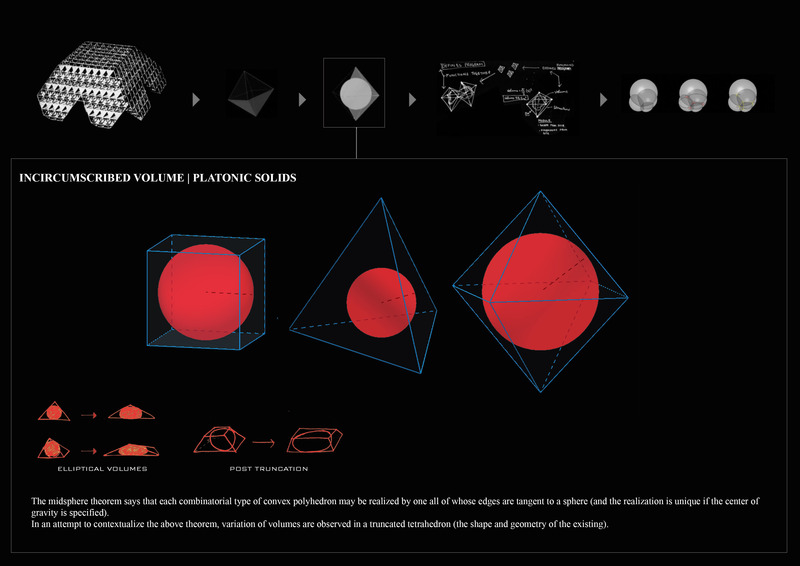 The iteration with the minimum surface area was chosen for material and cost efficiency. The current research establishes the veracity of the fact that the double-curved surfaces being the subordinates in the fabrication industry have the ability to optimise the overall cost of construction through the efficient use of material. 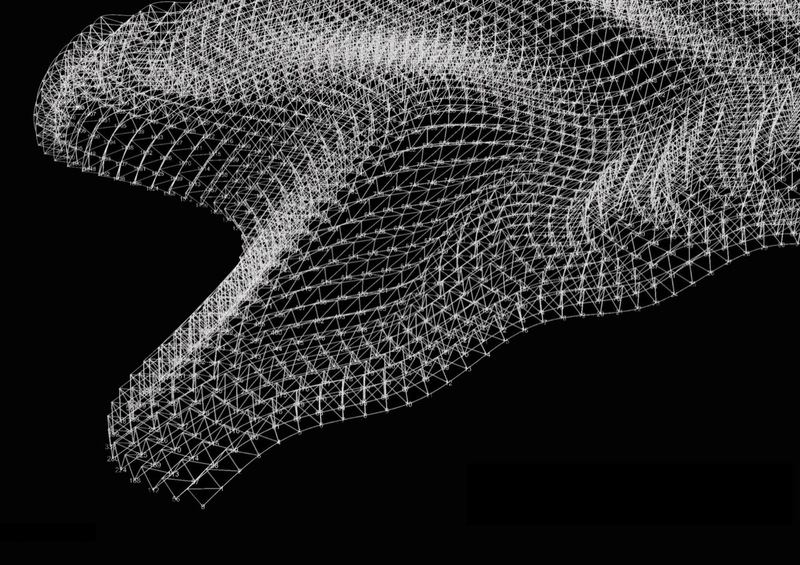 The generation and creation of the affirmative double-curved surface geometries might need to be coupled with an algorithmically and computationally driven design process to achieve a legitimate result. We can’t predict the future of everything but we can prepare ourselves for the complexities it might offer. Today’s architecture is full of such ever increasing complexities with a requirement for a sustainable future. Technology aids, assists and anchors the architects and designers in the present scenario and provides them with a legitimate tool to deal and cope up with the aforementioned complexities of design. Architects have been designing to accommodate the material limitation from ages and even today the architect’s design is altered to accommodate material limitations of today. Hindered and restricted exploration in designs due to material limitations have led to numerous issues in the past (use of steel on large scale wasn’t feasible in the past) which when addressed were eventually responsible for revolutionizing the whole paradigm of architecture. So, what’s is equally important to acknowledge is “Are we hindering another revolution” due to material limitation of today. It’s not like we do not have the technology, it’s just a matter of some smart choices. Analytically and empirically analysing the current issues relating to architecture it is felt expedient and imperatively necessary to bring about rectifications, interventions and articulations for the purpose of correcting the wrongs that as humans, architects and builders committed during the industrial revolution. A thought arises as to the need and necessity of rethinking the generation and creation a “shelter” for any given function or program. This warrants re-examining critically and chronologically the way a house/building was constructed in the previous eras and then apply the knowledge, understanding and conclusions drawn to adopt those principles to produce the required function/program as per the current and contemporary needs and requirements. To meet these demands one ought to learn a lesson from the nature, as it is beautifully complex yet organised in its own complexity. An interdisciplinary field called “biomimicry” is delving itself to look for such answers in nature by imitating and simulating the models, systems, and elements of nature for the purpose of solving complex human problems. Diagnostic studies and examination have led to a firm belief that the hypothesis is right, verified and confirmed. The objectives of the study have been fulfilled with the research. The entire process highlights the needs and necessities of reviewing, redesigning, redeveloping and revamping the system and structure in architecture. It will ensure continued improvement and advancement in the use of materials for achieving efficiency, economy, effectiveness and excellence in the execution of numerous innovatively articulated designs in architecture. Great to know that at-least academia is addressing refurbishment of Pragati Maidan critically. Paying heed to our modern heritage. Kudos Deepankar!